Whether you’re an aspiring or professional photographer or anyone that has lenses or filters to clean then look no further than this Phot-R 10-in-1 Cleaning Kit. Ideal for cleaning DSLR camera, video camera or camcorder lenses, and more. Suitable for cleaning all glass, plastic or multicoated optical lenses; this cleaning kit can prolong the life of your equipment and ensure continued high quality photography. Cleaning kit provides all the tools you need to maintain your precious camera equipment. All the tools included are useful and compact to allow you to easily carry them in your camera bag. Double sided lens cleaning pen in one features a dust removal brush on one side and a special non-liquid cleaning element on the other side which is designed to never dry out. 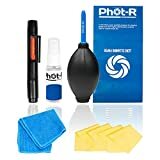 Phot-R 10-in-1 Cleaning Kit consisting of a Hurricane Blower, Lens Cleaning Pen, Microfibre Cloth, 4 Microfibre Fine Cloths, Lens Cleaning Tissue, Cotton Wool Swabs and a Spray Bottle to keep your camera, sensor and lenses clean. This air blower will safely clear dust from your sensor. Works well for removing dust specks off lenses, sensors and SLR mirrors without touching/damaging the surfaces. Fits comfortably in your hand and delivers a strong blast of air as it cleans. Essential 2-in-1 accessory for removing dust, smudges and oily finger prints from your lenses. Firstly remove the dust from your lens using the retractable cleaning brush made from soft bristles then use opposite side of the pen where the tip contains a special non-liquid compound to clean your lens. Apply gentle pressure on the lens using a circular motion, to remove any marks or smudges on your lens. Safe to use on all surfaces such as Digital Camera Housings, Camcorders, Mobile Phones, CD’s/DVD’s, and is ideal for cleaning your camera body and LCD screen. Designed to effectively clean and remove visible smudges and fingerprints. Can be used on camera sensor, lenses and all surfaces such as Digital Camera Housings, Camcorders, Mobile Phones, DVD’s and LCD screens. Soft gentle tissue-paper allows removal of oil, smudges, dirt and dust particles, allowing gentle and effective camera & lens cleaning. It is ideal for removing dirt and dust from plastic and metal materials. Reusable bottle which you can fill up with your cleaning solution. Please note bottle will be empty upon delivery. All Phot-R products come with a 1 year limited warranty. This entry was posted in Discount Photography and tagged 10in1, Blower, Bottle, Camera, Cameras, Canon, Cleaning, Cloth, Cotton, DSLR, including, lens, Microfibre, Nikon, Paper, Pentax, PhotR, Professional, Sony, spray, Swabs, Tissue, Wool by Ball Photo. Bookmark the permalink.